This is the place where you’ll find the best tub transfer bench for your particular needs. We’ve created the compact guide so the elderly can find plenty of safe options that they can rely on. One way we made sure that will always be the case was by including only user-praised pieces and by consulting dozens of expert reviews. The product that appealed to both past customers and professionals the most is the Drive Medical Backrest. Users seem to agree that the unit is easy to use and install, and they also appreciate the fact that it is made to survive intensive use. Moreover, the product offers enhanced stability, and since it has a molded backrest, the ultimate comfort. If the model for sale is unavailable or if the seller can’t deliver to your address, we suggest looking for the Invacare Transfer Bench, since it is equally safe and well-made. This transfer bench is made to fit any type of bath and to make sure you can clean yourself in the safest manner possible. It will assist you while entering and exiting the bath, thus offering a high degree of independence and privacy. Moreover, its sturdy backrest ensures maximum stability and is also reversible to accommodate any bathroom design without having to improvise. One person wished the part that hangs out of the tub didn't have holes in it since water can leak on the floor. Installing it is also safe and quick, and it can be adjusted to your liking. Buyers also appreciate the unit is light, weighing only 10 pounds. Furthermore, it is compact and easy to operate. The greatest highlight is the fact that it is ergonomically shaped, and that it comes with a reversible backrest which snaps in and out easily without any tools. Another clever addition is the built-in soap dish and hand-held shower holder, which makes for a more pleasant experience while bathing. It is a sturdy bench that won't rust in high humidity conditions, and it is a pleasure to use. There were a few reviewers who were disappointed with the fact that putting the unit together can be a hassle. The textured seat is comfortable even with extended use, and it comes with drain holes for added safety and to prevent bad smells. Also, it can be used by seniors weighing up to 400 lbs. Right from the start, you will see that the bench can slide from left and right and vice-versa along the durable frame. This small detail will allow easy entry into and out of the tub. Also, note that the seat height adjusts in 1/2" increments, so you can customize the product to fit your body type. The one thing that sets it apart is the foldable design - the item folds flat for transport and storage. A concerned customer noticed that the mesh under the seat could be a bacteria trap if you don't remove it. To maintain the bench is easy as well since it can be washed with soap. And to take safety to new heights, the unit features a belt and a safety net. Moreover, it has a 300 lbs weight capacity. If you’re looking for an awesome transfer bench for bathtub, you’ll be happy with the options below. We’ve selected them based on their versatility and on the fact that they can be easily used by the elderly. Moreover, they are safe and will last you for a long time since the products are made from premium materials. The plastic transfer bench accommodates any type of bathroom because of its reversible bench and handy extension legs. The legs also feature large suction cups that lock on the tile to provide added versatility and safety and, more importantly, they have an adjustable height. The model’s sturdy “A” frame construction and durable blow-molded plastic bench offer maximum stability, even if you have a larger body type. Furthermore, it features tool-free assembly leaving no hardware piece exposed. 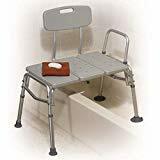 Since it is easy to use, this versatile transfer bath bench is ideal for seniors who need support getting in and out of the bathtub. The transfer bench is crafted from durable blown plastic that is designed to withstand daily use. Overall, it was cleverly created to be light and intuitive, so the elderly can reclaim their independence. It prioritizes comfort and safety, and it doesn’t disappoint when it comes to durability since it is rust-proof. The transfer bench has a one-piece, blow-molded design which rocks adjustable aluminum legs so it can survive many years of intensive use. Furthermore, it features a textured, non-slip seat that also has drain holes so it can prevent slips and bacteria buildup. Its handles are ergonomic and textured, and the piece also comes equipped with a hand-held shower holder that makes bathing a pain-free experience. To that extensive list of features, you should also add the 400 lbs weight capacity, and you’ll see that you have an impressive product on your hands. 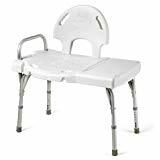 This Invacare bench also has a comfortable seat so you can sit down as you shower, and the arm rail will provide you with additional support. If your mobility is in any way restricted or if you’re using some type of crutches, a walker, and alternatively, a wheelchair, this product will help you safely transfer in and out of the tub without fear of slipping. No one can deny that this bench allows you to comfortably sit down outside of the tub and then slide yourself into the tub without straining your muscles. You can even lock the seat in place and remain seated as you shower, without fearing you will hurt yourself in any way. The model offers a pleasant experience, and it helps eliminate the need for assistance, thus increasing your independence and privacy. The sliding transfer bench is ultra-lightweight and can be assembled without the use of tools. The nifty adjustable-height legs allow you to set the height that fits your needs the best. Moreover, the large non-slip suction cups on the feet attach to your tub tile, making it a stable and secure place. For added convenience, the bench also includes a safety net to help catch dropped items such as shampoo bottles, and a detachable soap dish, so everything you need is within reach. The unit ensures a stable, comfortable and quick transfer in and out of your slippery bathtub or shower. Crafted to provide the ultimate peace of mind, this transfer tool supports up to 400 pounds, which is impressive. It fits a wide variety of tubs and showers, no matter their sizes, thanks to its adjustable height. Moreover, the non-slip surface of the seat provides a stable and comfortable experience, while the basket organizer offers a helpful place to store all your toiletries and bathing essentials. And with its white glacier finish, this bench has a clean and simple look that complements almost any interior. The support handle provides even more stability and it also helps ensure a safer transfer. This unit assembles in as little as 25 minutes, and it can be set up in both right-facing and left-facing orientations, as a premium unit should. Ultimately, the height can be adjusted between 16.5 and 21 inches. This heavy-duty plastic transfer bench created by the popular brand Drive Medical is made extra strong, so it will be capable of withstanding a large weight capacity of 500 pounds. The piece easily accommodates any bathroom due to its reversible bench and extension legs that feature extra-large suction cups that lock to any surface to provide added versatility and safety. The patented “Dual Column” legs have a height that can be adjusted in 1/2 inch increments, which makes the unit easy to use. The sturdy “A” frame construction, durable blow-molded plastic bench, and backrest are other additions that ensure maximum stability. Moreover, this product features tool-free assembly, and it leaves no hardware exposed. People also like that the pieces don’t take up a lot of space and that it can be easily moved since it is light. It was created by the brand to stand the test of time like a pro, and it will provide comfort even if used for an extended period. The Carex bench was designed and developed by experts after extensive research and valuable input from occupational therapists and healthcare professionals. The model’s backrest has two built-in handles to make positioning easier, and it is highly comfortable even with daily use. This bench converts easily for either left or right-hand bathtub entry so it can fit any type of bathroom and use. It rocks a compact size, and it has an extra weight capacity, so the whole family can use it when mobility becomes an issue. Furthermore, the seat contains drainage holes. Whether the mobility issue is temporary or permanent, the Carex shower transfer bench would be a helpful addition to in-home safety equipment. It is highly durable, soft to the touch and overall, it provides plenty of features to justify its price. Users also appreciate the fact that it is quick and smooth when it comes to mounting. If you want a product that’s compact in size and that features a weight capacity of up to 400lbs, then you’ll love this model. It is also important to note that the item has no metal parts to rust or corrode. Moreover, the comfortable transfer bench fits most bathtubs and showers, making it effortless to install and easy to use. One side of the bench sits outside the tub, while the other inside it. This will allow you to simply sit on the outside seat of the unit and then slide the legs around to the inside bath bottom. You’ll be happy to learn its legs are easily adjusted to sit flat and secure, which is ideal for tall and short people. The transfer unit disassembles quickly and comfortably for storage or travel so you’ll never have to make compromises. It also features a backrest with two secure built-in handles to make positioning easier. People like this piece because, besides being sturdy, it is also comfortable. It rocks an appealing design, and it won’t look out of place in any bathroom. The premium transfer bench has six legs and a special support structure that provides maximum support for larger users. Furthermore, the direction of the seat’s backrest can be reversed easily without any tools, depending on your preferences. Smart suction cup feet grip the tub’s floor for added safety even when it’s wet. This allows users to enter and exit the bathtub safely and with confidence. The heavy-duty item can survive intensive use and has a maximum recommended weight capacity of 550 pounds, which is way above the industry’s standard. It is safe for the elderly, and it doesn’t have to be mounted on your wall. And since the seat has drainage holes, it will prevent bad smells and bacteria from building up. This unit provides three things – safety, comfort, and peace of mind, which is more than enough for most users. It’s engineered to please demanding customers and to survive heavy use while also offering exceptional beauty and uncomplicated style. The special clean design will help you relax as you take a shower and will make you forget about your restained mobility. The Moen-made piece features split seating, and it comes equipped with a built-in drainage system to increase comfort and also extend the product’s life. It will help you receive the most effective support for daily personal care and the highest standard in functionality. Buyers also mention that they like the fact that it helps you gain back privacy and that it can be easily carried from one place to another. This is because the unit is compact and made from lightweight materials, especially chosen so they can survive even a heavy load. The deluxe item is designed with an extended seat which allows the seated user to transfer easily and to bathe without a worry. Moreover, it comes with a built-in soap holder, and a handheld shower holder, so you won’t have to extend your arms or raise from the seat. The back is entirely removable and converts easily, so you can choose the side you prefer or the one that matches the style of your bath the best. The skid-resistant rubber tips on the legs have an extra-wide suction base, a thing that adds an extra layer of safety and security. Another thing that you get is an aluminum frame that sustains a heavy-duty blow-molded seat that’s easy to clean and comfortable. Ultimately, the transfer bench has a 500-pound weight capacity, and it weighs less than 17.5 pounds so it can be highly portable. Bathing is a fundamental part of everyone’s life. However, it happens to be a dangerous activity for someone with limited mobility due to age or disability. And since it has to be completed on a regular basis, choosing the right tub transfer bench is a vital task, reviews of tub transfer benches tell us. Selecting the right unit for your situation can help you or your loved one prevent life-threatening injuries due to slips and falls in the bathroom, a tragic event that happens thousands of times a day to many seniors. The first thing you’ll have to choose is the right pad for your needs. Premium padded sliding transfer benches are generally more comfortable to sit on for longer periods, especially if you are very thin and boney, or if you love to take long showers. However, they are also more expensive than hard-surfaced products. Another thing to take into account is that they are generally not as easy to keep clean and they can get wet after the coating that makes them waterproof gets worn out. This way, the items can even become a health hazard if bacteria start to accumulate underneath the pad. You could opt for a bathtub transfer bench with opening to prevent that from happening. Unpadded benches are less expensive, but they are slightly easier to push from one end to the other as the hard surface makes it easier for you to push down on and it has less friction than padded tub benches. But the pad doesn’t only apply to the seat or backrest. You can also find items that have legs with padded tips. Although they are great for not scratching your floor, we recommend suction cup legs. The purpose of suction cups is to provide an extra level of security to prevent the transfer bench from moving. The clever suction cups can be added to the two legs that fit inside the tub or all four legs in the case of a shower seat. Many clever shower seats will have both types of legs. A handicap bathtub transfer bench will typically start around a 420 lbs weight capacity mark. There is no official “bariatric weight level”; however, a good rule of thumb would be to buy a transfer bench for people over 250 lbs to be safe. Your choice should also depend on your body size and your tendency to gain weight. If you weigh more than 350 pounds, for example, you don’t want to buy a bench that has a maximum weight capacity of 250 pounds. The vice-versa also applies. Moreover, having a removable back on a tub transfer bench can act as a comfort feature as well as a support piece for those people with weakened trunk balance and a weak core. Purchasing a good tub transfer bench with a back is generally only slightly more recommended than a non-back chair. Sturdiness is also a priority if you want a bench that stands the test of time. A durable model won’t pose a safety risk, so you should look for one made from long-lasting plastic, and that has a rust-resistant frame. Don’t overlook this aspect, if your bathroom has high humidity levels and if you want to invest in products that make for awesome granddad gifts. Adjustable height legs are convenient for many reasons and are worth paying a few extra dollars to get them. People come in all heights, as we know, and so do the bathtubs they are trying to climb into. Having adjustable legs may allow senior families to use the same tub transfer product as well. Size is another important factor that the elderly should consider when in the market for the best bathtub transfer bench. If you’re unsure of the size that you should get, measure your bathtub first and then make sure that the bench dimensions will fit in your tub area. Besides checking that the bench has non-slip suction feet for stability, also see if the product comes with a seatbelt for extra security. This is a clever addition especially if you get dizzy quickly or if the steam from the showers you’ll take is considered a risk factor. And if you want to take safety even further, you can also invest in an inexpensive non-slip bath mat for the elderly. Also, make sure you go for cheap tub transfer benches that are easy to install, just like you would when it comes to a heavy-duty bath seat for elderly citizens. Some modes can be directly placed inside the tub, and in addition to the free-standing models, some models are designed to be clamped to the tub wall or screwed to the bathroom wall. What is a tub transfer bench? A transfer bench is also known as a showering bench, and it’s a bath safety mobility device on which the user can sit to get into a bathtub or a shower. The senior usually sits on the bench, which then straddles the side of the tub, and after that, it gradually slides from the outside to the inside of his or her tub, much like an easy-to-use lift chair. These types of products are used by those who have trouble getting over the tub wall or into the shower, either because of illness or disability and age and are recommended by doctors all around the world. Are tub transfer benches covered by Medicare? Original Medicare, parts A, and B generally don’t consider a shower bench to be durable medical equipment. So even if you or your life partner qualify for Medicare by either age or disability, tub transfer benches don’t necessarily qualify and would not be covered under Original Medicare. Unfortunately, the same thing applies when it comes to the life-changing grab bars for shower. Moreover, according to Medicare, if items aren’t used primarily for a medical reason, they might not fit into Medicare’s definition of medically necessary equipment. That being said, there are quite a few ways to get around it, but that requires a dialogue with your insurance company and your GP. How to install a tub transfer bench? Installing one of these benches can be either super easy or extremely hard, just like it is with top-of-the-line Hoyer lifts. One thing to know from the start is that there are models that come pre-installed, so all you have to do is get them out of the box and start using them. Other units require power tools and screws, and they can usually be mounted on walls. They provide a high degree of safety, but you won’t be able to install them by yourself. Moreover, there are pieces that use clips and suction cups, which are still safe but effortless to use and mount. How to use a tub transfer bench? Using a transfer bench is easy. First, to transfer to a bench from a standing position, you’ll have to sit down on the side of the product that is also outside the tub. The second step is to reach out and grab the armrest for support if needed. Next, make sure that you lift each leg over the side of the tub wall and that you slide your body over to the center of the transfer bench, with the backrest behind you. Conversely, to get out of the tub, slide over to the edge of the bench, lift each leg over the tub wall, and push yourself up from the bath bench. Additionally, to prevent injuries associated with bathrooms, we suggest looking for safe and healthy osteoporosis treatments, and if your budget allows you, also take a look at the greatest senior life alert systems the market has to offer.